You are here: Home / News / What ‘s a typical electric bill in Williamsburg VA ? 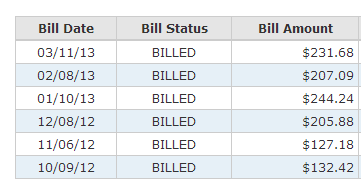 What ‘s a typical electric bill in Williamsburg VA ? A question I am often asked by folks considering a move to VA is “ What are your utility costs in Williamsburg VA ? Let me break it down in a few posts with the first being electricity. Our power supplier here in Williamsburg is Dominion Power. Our home was built in the 1980’s and is 3200 square feet. It is an all electric home with heat pump for heating and cooling, electric hot water heater, electric stove, etc. The heat pump was replaced with a 16 SEER rating unit recently. .
We have two teenage boys and my wife does at least one load of laundry a day. Below is our actual usage for the past six months. If our home were newer or had an insulation upgrade (next on our list) I am certain we can reduce our usage a bit more. All in all considering the size of the home and four occupants its pretty reasonable. Folks purchasing newer smaller homes these days will see total bills in the $150 a month range for electric /gas. I will cover our typical cable, internet, phone, water and sewer costs in the next post.